The only drug free approach to ADD and ADHD in South Africa. Increased focus, self control and concentration. One 48 hour program no repeat visits. 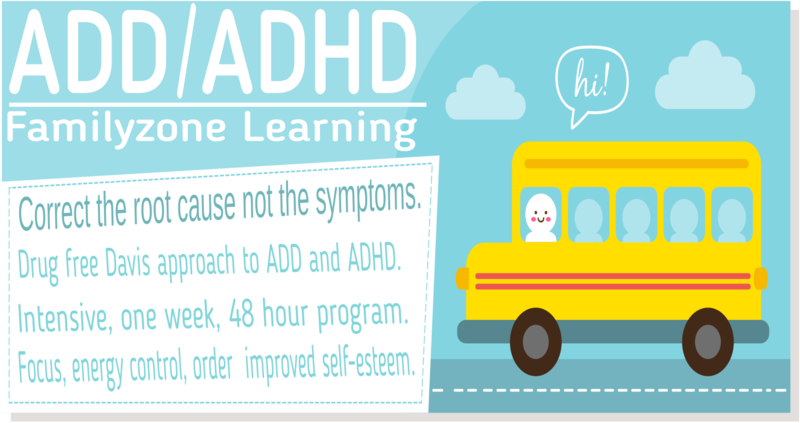 The Davis Attention Mastery Program empowers ADD ADHD individuals with effective tools that enable them to stay focused on the task at hand. The program also teaches control of activity levels to make sure the correct amount of energy is used for a specific task (avoiding hyperactivity or hypo-activity). This will allow people with ADD ADHD to use their creative talents while at the same time enforce correct social behavior. The Davis Attention Mastery program does not focus on the signs or symptoms of ADD ADHD (as these can change daily), the method rather focuses on the root cause to eliminate any of the symptoms or signs associated with the inability to focus, control energy level or to eliminate any inappropriate social behavior. An ability to think in pictures. No concept of tracking time. Finds it difficult to maintain order. Struggles to see the relationship between cause and effect. The concept of consequence is a challenge. Most often these root causes lead to an associated label such as ADD ADHD. *The above information is in no way intended as medical advice or as a substitute for medical counseling.